Even people without a chimney or a flue can enjoy the warmth and cosiness that only a gas fire adds to a home with the Gazco Logic HE Balanced Flue Gas Fire. This gas fire was designed for installation on a flat, external wall. It will fit perfectly in a standard fireplace opening of 16 by 22 inches as well. 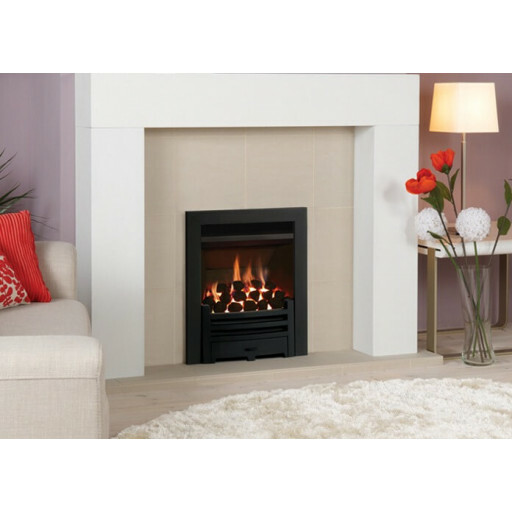 The Gazco Logic HE balanced flue gas fire is a high efficiency appliance with an efficiency of between 81 and 99%. The gas fire can generate between 4.1kw and 5kw of heat output. For fuel, the fire uses either natural gas or liquefied petroleum gas depending upon the burner ordered when purchasing. The sleek, modern designed fascia of this gas fire means that it will fit in well with almost any type of décor. You also have the ability to customise the appliance when purchasing with options available relating to the colour of the trim, fuel effect and control options. This makes the Gazco Logic HE balance flue gas fire an extremely flexible appliance, perfect for almost any home. Gazco provide a five-year warranty on the product. WE HAVE HAD A POWER FLUE FIRE FOR YEARS WITH A VERY NOISY FAN SO WNET TO THE FIREPLACE WAREHOUSE TO SEE IF THERE WERE ANY ALTERNATIVES AND WERE VERY PLEASED TO FIND OUT WE COULD HAVE A BALANCED FLUE FIRE WITH NO FAN AND MUCH MORE EFFICIENT. great hot fire and good quality looks great. Fabulous hot fire. we didn't think we could have a gas fire but we were told we could on an outside wall. Highly recommended.